Enjoy 3% cash back on your debit card purchases plus get refunds on your ATM withdrawal fees, nationwide! * Earning your Kasasa Cash Back checking rewards can almost feel like you’re getting paid to shop! Qualifying for Kasasa Cash Back Rewards Is Easy! Don’t worry if you don’t meet these qualifications— your account is still free. Plus, you can get right back to earning your cash rewards the very next cycle that you qualify. Open your Kasasa account today! *Checking account eligibility is subject to age and ChexSystem verification. View our Service Pricing. This disclosure contains the rules that govern your deposit account as of December 1, 2018. Account Overview: Kasasa Cash Back: A free variable reward checking account with no minimum balance that rewards accountholders with cash back on their debit card purchases and nationwide ATM withdrawal fee refunds when they meet minimum qualifications during the account's Monthly Qualification Cycle. Kasasa Saver is a free, variable rate, deposit account with no minimum balance that rewards accountholders with dividends when they meet the minimum qualifications associated with their linked Kasasa Cash Back checking account during each Monthly Qualification Cycle. Purpose and Expected Use of Account This account is intended to be the accountholder's primary share draft account in which payroll transactions and day-to-day spending activities including but not limited to grocery, gasoline, apparel, shopping, dining, sporting and entertainment transactions are posted and settled. Commensurate with the spending activities identified above, we expect the account's debit card to be used frequently throughout each month and for transaction amounts to reflect a wide dollar range. Small debit card transactions conducted on the same day at a single merchant and/or multiple transactions made during a condensed time period particularly near the end of a Monthly Qualification Cycle are not considered normal, day-to-day spending behavior. These types of transactions appear to be conducted with the sole purpose of qualifying for the account's rewards and thus will be deemed inappropriate transactions and will not count toward earning the account's rewards. Eagle Community Credit Union reserves the right to determine if the account is being maintained for a purpose other than day-to-day, primary use. Accountholders who persist in making debit card transactions in a calculated and limited fashion in order to meet their monthly qualifications may have their accounts converted to a different share draft account or closed altogether. We also reserve the right to convert the account to a different share draft account if the account does not have consistent active use over 2 consecutive Statement Cycles. We have the right to close this account at any lime, with proper notice. Our decision to close the account will not affect your existing obligations to us including any obligation to pay fees or charges incurred prior to termination. No deposits will be accepted, and no checks will be paid after the account is closed. If the account is closed, you will forfeit any rewards that have not been credited to your account. 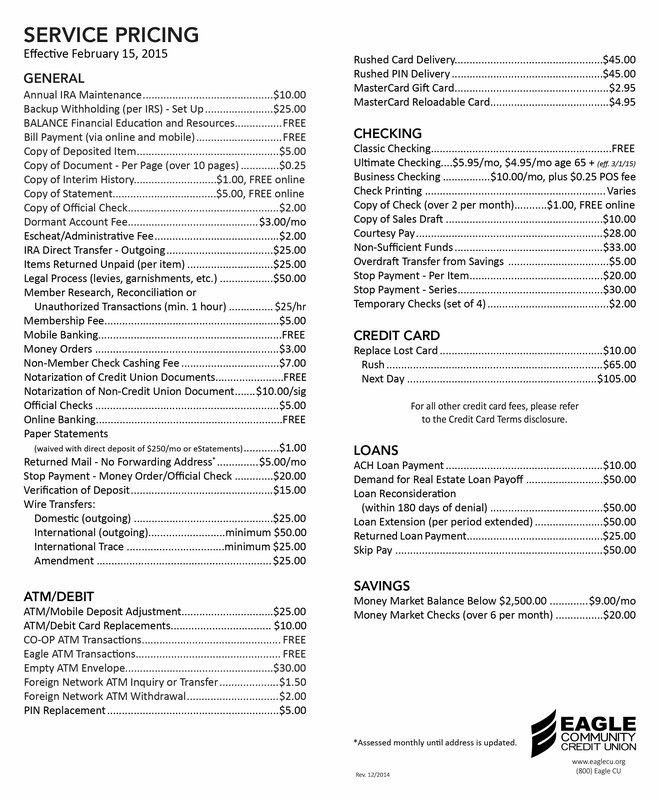 A Eagle Community Credit Union check for the remaining balance, if applicable, will be mailed to accountholder at the address indicated on our current records. Upon termination of your Kasasa Cash Back with Kasasa Saver account, any optional add-on products / services associated with this account will also be terminated at the same lime. If, for whatever reason the Kasasa Saver portion of your account is closed, your account will automatically be converted to a standalone Kasasa Cash Back account and only the Kasasa Cash Back terms and conditions articulated within this disclosure will apply. Dividend Rate & Annual Percentage Yield (APY) Compounding & Crediting: Dividends will be compounded monthly. Dividends will be credited to your Kasasa Cash account on the last day of the current statement cycle. If you close your account before the dividends are credited, you will not receive the accrued dividends. Dividends begin(s) to accrue on the business day you deposit noncash items (for example, checks). "Business Day" means a calendar day other than a Saturday or a Sunday, January 1, the third Monday in January, the third Monday in February, the last Monday in May, July 4, the first Monday in September, the second Monday in October, November 11, the fourth Thursday in November, or December 25. If January 1, July 4, November 11, or December 25 falls on a Sunday, the next Monday is not a Business Day. ·statement Cycle" means the period of lime for which Eagle Community Credit Union provides a summary of the financial activities and transactions that post and settle to the accountholder's account. Balance Computation Method: We use the daily balance method to calculate the dividends on your Kasasa Cash account. This method applies a periodic rate to the balance in the account each day. Dividend Rate & Annual Percentage Yield: When your Kasasa Cash Back account qualifications are met during a Monthly Qualification Cycle Federally insured by NCUA. Your Savings Insured To $250,000 Per Account. Kasasa, Kasasa Cash Back and Kasasa Saver are trademarks of Kasasa, Ltd., registered in the U.S.A.